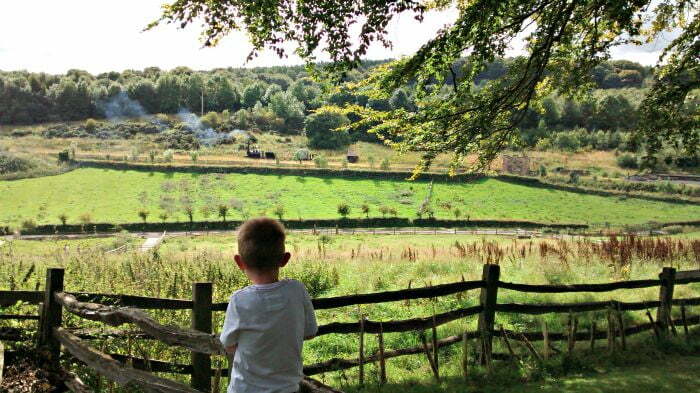 Beamish is a great day out for toddlers and young children. 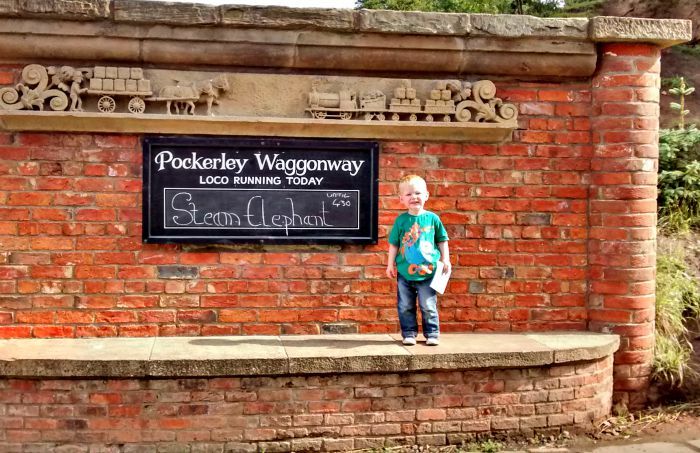 It’s got all the key things for a perfect day out for a toddler – tram, train and bus rides, lots of animals to see and being able to explore new and different surroundings. 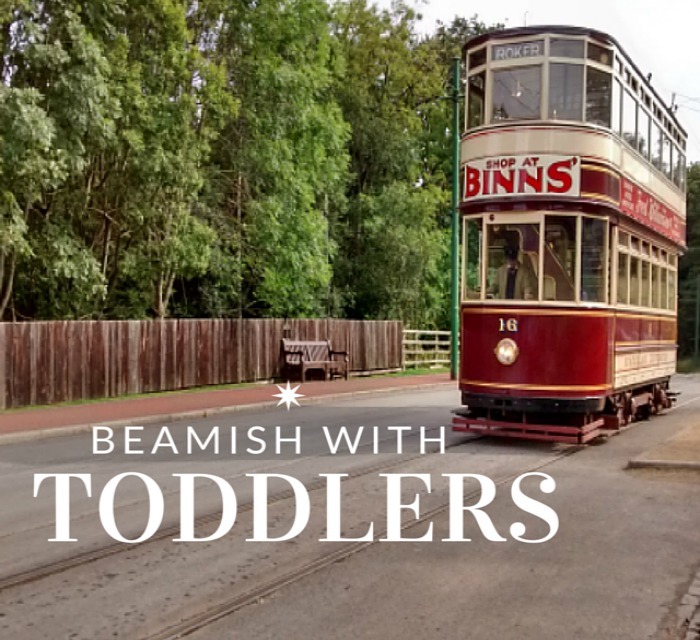 We visited Beamish in August 2015 with our 2 boys aged 5 and 2, and these are our top tips for visiting Beamish with toddlers and preschool children. Avoid the crowds and start your day by wandering down the hill towards Pockerley Old Hall. 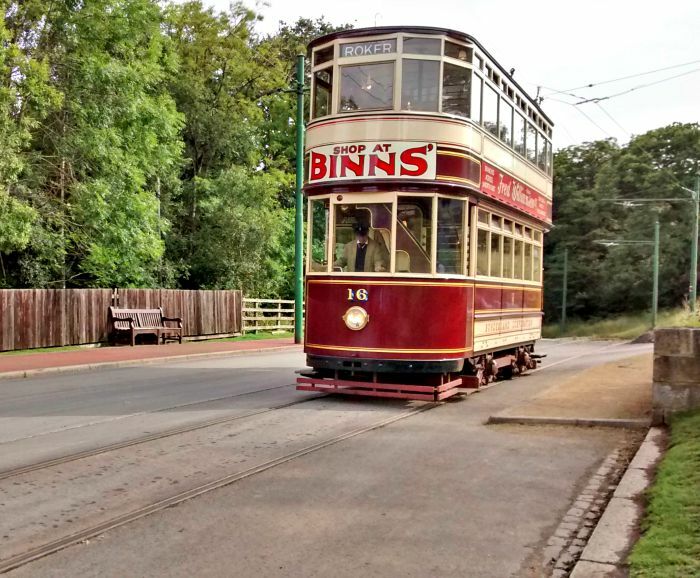 Most people arriving at Beamish choose to wait for one of the frequent trams or buses to take them around the site, but just a 5 minute walk from the entrance is the 1820’s Landscape and Pockerley Old Hall. 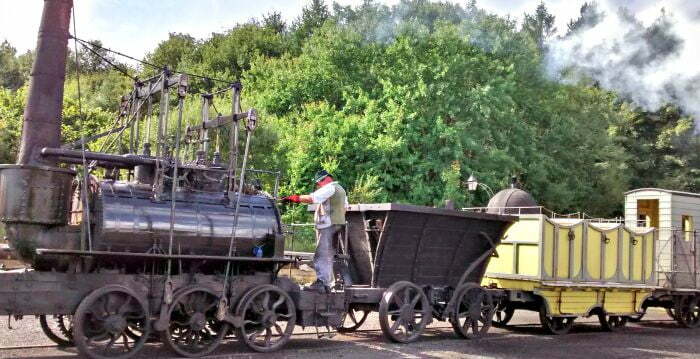 Children will love the locomotive at Pockerley Old Hall which takes visitors on little rides around the yard. Aprox 10 min walk from the 1820’s Landscape is the 1900’s Town. This bustling town was one of our favourite parts of Beamish, and is so much fun for inquisitive toddlers. The smell of bread, biscuits and cakes being cooked, using Edwardian recipes, emanated from Heron’s Bakers so we just had to go in and buy some (I can confirm that they tasted just as good as they smelt). Vehicle mad children will love seeing the typical 1900 cars and motorbikes at the Beamish Motor & Cycle Works garage. They will also have fun browsing the shops and seeing what they can buy – the sweet shop is a particular favourite! Redman Park, just off the main street, is great for letting off a bit of steam. This beautiful park is full of carefully tended summer flowers, and is a hive for people wanting to relax in the sun. During the summer season bands play in the band stand. Ravensworth Terrace is where the residents of the 1900’s town lived, and visitors are able to explore their houses. Toddlers will love investigating the different houses and seeing the children’s toys and bedrooms and seeing how they compare to theirs! When we visited, the 1900’s Fair was in full swing with traditional fairground rides such as the Steam Gallopers and a coconut shy (payable extra). There was a real carnival feel with families enjoying the fair and large sandpit complete with deckchairs! 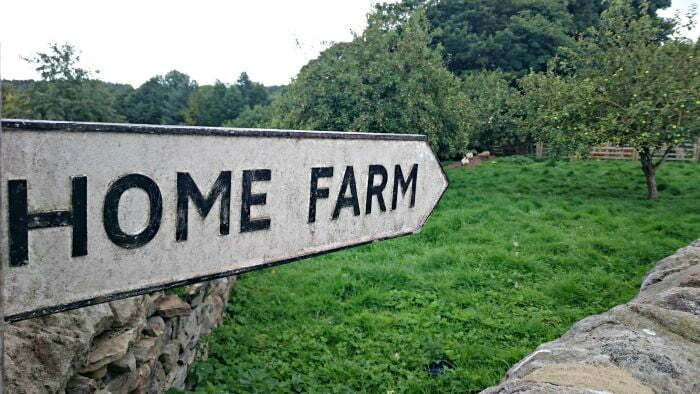 Toddlers and young children will love visiting the 1940’s farm and meeting the pigs, chickens, horses and cows. 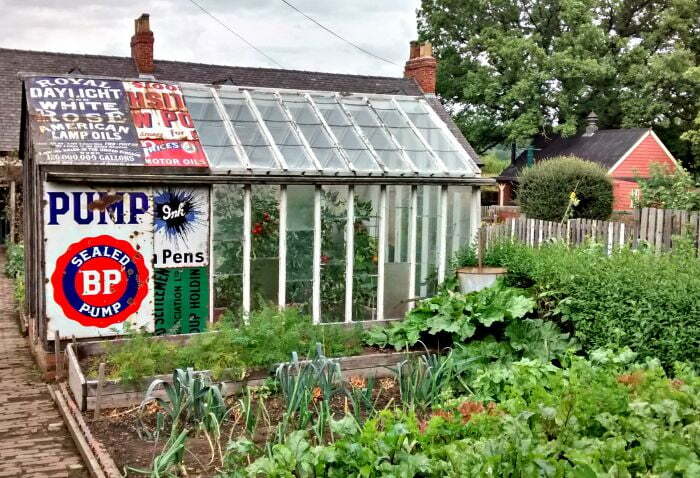 There is also a 1940’s tractor and farm house to see too. 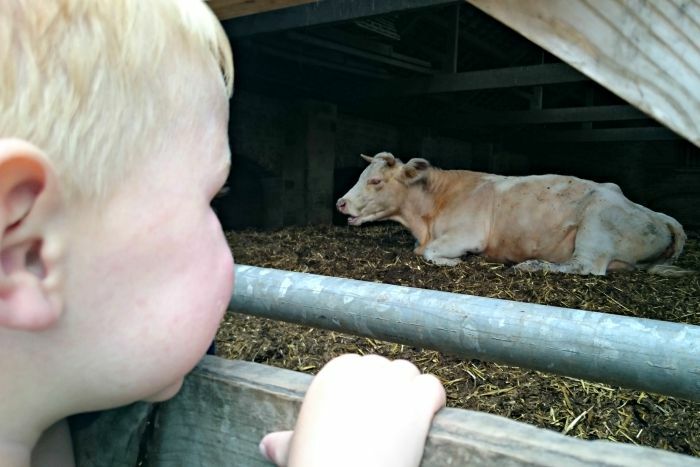 Toddlers will love meeting the animals at the 1940’s farm. The Pit Village shows you where miners and their families used to live. There is also the village school which wasn’t as inviting and fun as our schools nowadays. The toys were very limited and the classroom was full of desks lined up. Outside in the school yard, there were traditional toys to have a go at. There are frequent trams and buses running round the site to transport visitors between the various sections, but equally it is just as pleasant to wander through the fields and enjoy the countryside and peaceful surroundings. Prams have to be folded up on the trams and buses. Beamish is a large site so I would definitely recommend taking a pushchair or baby carrier for toddlers. Redman Park in the 1900’s town is a good place for a picnic, but there are loads of food outlets throughout Beamish which we were impressed with. You can get fish and chips in the Pit Village, grab something from Heron’s Bakery in the 1900’s town or do as we did and eat in the Tea Room in the 1900’s village. This serves a variety of sandwiches, hot and cold snacks and we were impressed with the quality and price of the food here. Baby food was available to buy at 85p. Kids lunch boxes were £3.75 for 4 items including a (good sized) sandwich and 3 other items of your choice. I had an egg salad sandwich which was made with fresh bread and was very tasty. There are plenty of baby changing facilities throughout Beamish and these had ‘real’ changing mats in them! Thanks to Beamish for our tickets for the day. I’m really sad to say I’ve not been to Beamish since I was little. I’m pretty confident my kids would love it! I’ll have to visit soon, thank you for your tips about where to go to avoid the crowds, and great to see a review with a focus on the important things like changing mats and kids’ meals! Would you recommend a mid-week visit or a weekend? Is it the kind of place that’s half closed during the week? Thank you for linking to #daysoutwithatoddler! Hi – We went on a bank holiday weekend, and it was quite busy but Beamish is on a large site so you can avoid the crowds. There were queues for the buses and for some of the food outlets but you can walk and take your own food. It’s definitely worth a visit though! Beamish is great – we could have very easily spent more than a day there. I’d love to go back.